Charli XCX + SOPHIE performing live together for the first time, Chicago’s Teklife crew featuring the Era footwork crew, UK experimental pop group Stealing Sheep, Toronto grunge-punk rippers Dilly Dally, and a pair of electronic pop artists responsible for two of the best records we’ve heard in the last year, 100% Electronica’s George Clanton and Negative Gemini. DJ sets throughout the night from Kristin Kontrol (Dee Dee of Dum Dum Girls), HINDS, and Joel Ford. 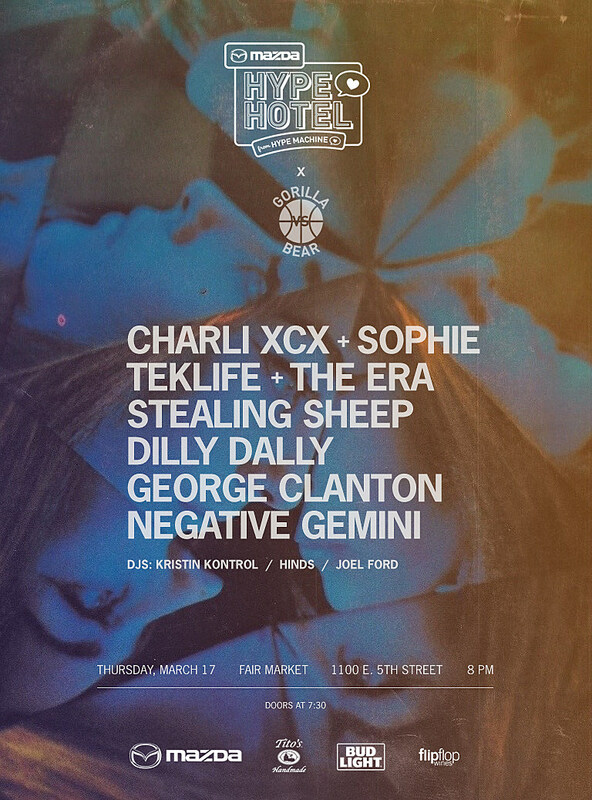 The party goes down on Thursday, March 17, at the Hype Hotel (the Fair Market building on E. 5th). Doors at 7:30, so get there early. RSVP right here.